This article is a short summary of Pikmin 2. 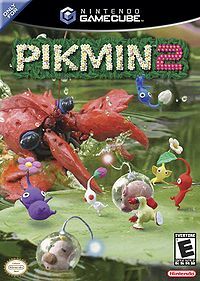 Pikmin 2 is a real-time strategy video game released for the Nintendo GameCube in 2004. Developed by Nintendo EAD, it is the sequel to the 2001 game Pikmin and takes place directly after its predecessor's ending. Return To The Pikmin Planet! After crash-landing on an alien world inhabited by tiny Pikmin, Captain Olimar has returned to his home world to find that his employer, Hocotate Freight, has been driven to the brink of bankruptcy! Now, Olimar must return to the Pikmin planet with his trusty assistant, Louie, to find valuable treasures in a desperate bid to pay back their company's massive debt! After escaping from the planet he was trapped on in the first game, Olimar returns to Hocotate only to find his employer, Hocotate Freight, has gone into debt. In order to pay off the massive debt, he and his co-worker Louie must return to the Pikmin planet to find more items that are worth something on Hocotate. Many of the items they find are real world products and items. In Pikmin 2, players lead a squad of Pikmin across various landscapes in search of treasure. There are five different types of Pikmin, each with their own unique abilities, that players must make use of to defend themselves and retrieve treasures, which are often guarded by enemies and traps. Players must keep track of the time of day and the number of Pikmin they have (up to a maximum of 100 on the field at one time). Players can also delve into underground caves that, while usually more dangerous than the surface, are often filled with large quantities of treasure. These caves are guarded by powerful boss creatures. There are a total of 201 treasures and 14 caves spread across the game's 4 areas. The Pikmin themselves come in five varieties, distinguished by their colors. Red Pikmin, the first type players have access to, are immune to fire and are more effective in combat. The yellow Pikmin have changed powers since the first game; rather than lifting bomb rocks, the can now be thrown higher than other Pikmin varieties and are immune to electrical damage. Blue Pikmin have gills which allow them to breathe underwater. Purple Pikmin, one of the two new species of Pikmin introduced in Pikmin 2, are much larger and stronger than the other types, enabling them to lift ten times as much weight and stun enemies when thrown. White Pikmin, the other new Pikmin species, are immune to poison clouds, capable of detecting buried treasure, and toxic to enemies that eat them. This page was last edited on 16 June 2016, at 14:22.